← Healthy Whole Grains – You bet! Fast forward several years and I have seen an increase in awareness about GMO’s. I was just at a breakfast with local moms and it came up in conversation. So here’s the deal: it is genetically engineered food (a plant or meat product) that has had its DNA artificially altered in a laboratory by genes from other plants, animals, viruses, or bacteria, in order to produce foreign compounds in that food. This type of genetic alteration is not found in nature, and is experimental. The correct scientific term is “transgenics,” and is also often referred to as (GE) genetically engineered. Unfortunately, they are generally representative of the foods we eat. According to the Grocery Manufacturer’s Association, 80% of packaged foods contain genetically engineered ingredients – but you wouldn’t know it by reading the labels. GMO crops are also added to processed foods as oils, sweeteners & soy proteins and in things like amino acids, aspartame, vitamin C, flavoring (natural & artificial), maltodextrins and more. It’s unfortunate that GMO’s are in our food system without knowing the total repercussions of the harm it may cause. Currently Canada and The United States do not require labeling on genetically modified foods. 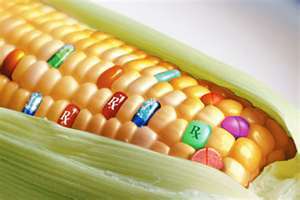 However, there are 50 other countries world-wide that have a bans or restriction on GMO’s, including Mexico. Today, California wants to lead the way in a ballot initiative to label foods that have been genetically modified. Visit www.labelgmos.org for more information on how you can help lead the way in this initiative. In the mean time, you can download this shopper’s guide to find out how avoid certain foods that might be GE. Here’s a quick tip: Food labeled organic can’t include GMO’s. And corn is one of the leading foods that has been GE’d. This entry was posted in GMO Foods, Health, Nutrition, Organic, Pestistides and tagged corn, genes, GMO foods, labeling, organic, plants, shopper's guide. Bookmark the permalink.